Humans, world over, used some form of shelter to insure survival. The type of shelter is normally influenced by a combination of geographical, environmental, ecological and social conditions though other mitigating factors also play into the equation. 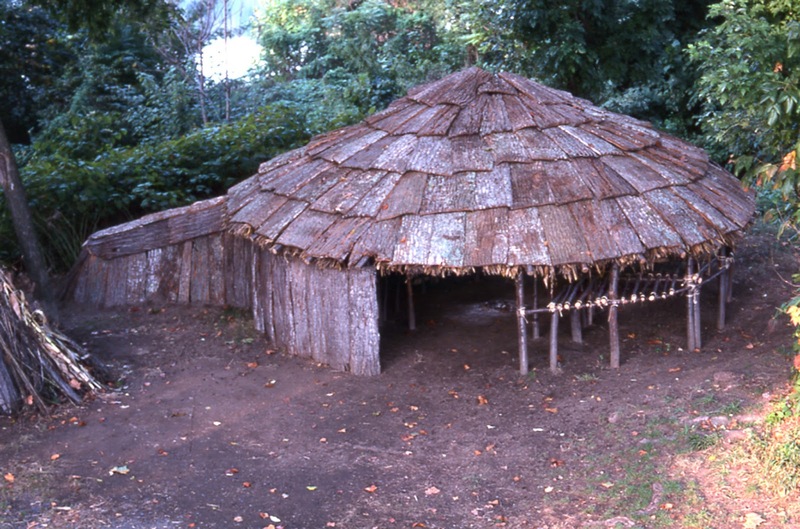 During the Late Woodland and Late Prehistoric periods A.D. 700-1550, native peoples living along the rivers and streams of Pennsylvania employed certain types of architecture that changed little over time. Archaeology is the principal tool that scholars employ to decipher the past, and it is precisely archaeology i.e. postmolds that contribute to our understanding of Native American architecture and settlement patterns. Archaeological sites linked to these periods, yield clear evidence of the type(s) of houses and their arrangement within a settlement. Anthropologically, this is fundamentally understood as the community pattern. Observed differences in community patterning can be demonstrated for different parts of Pennsylvania. For this discussion, we will use three major physiographic regions to illustrate the diversity of Native American architecture that scholars have identified across the landscape through archaeological studies. In this region of Pennsylvania houses were principally round-shaped structures organized around a central plaza and surrounded by a palisade. 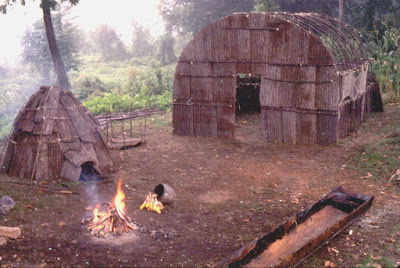 Houses were vaulted wigwams with bark covering and sometimes had a semi-subterranean appendage built onto the sidewall. This type of architecture was common to the McFate, Meade Island and related people from A.D. 1000 – A.D. 1400. Longhouses, likely constructed with vaulted roofs and sheathed with bark were used by Iroquoians on the Upper Allegheny and Lake Erie Plain. These were encircled with palisades. Monongahela and other groups in the lower Upper Ohio Valley and Allegheny Mountains built wigwams and a curious form of house having straight to slightly out-sloping side walls and a conical roof of bark. Arranged around an open plaza and protected by a palisade both types had the semi-subterranean appendage feature, others were free-standing. After A.D. 1575, a plaza centered petal-structure consisting of a large circular structure with multiple appendages began to appear on Foley Farm phase settlements. Late Woodland house types in the central and upper Susquehanna were stereotypically vaulted longhouses. There was a tendency for this form of dwelling to increase in length over time. Early in the Late Woodland Clemson Island Early Owasco periods, these were better described as “short houses” resembling a cube in shape. The community pattern appears to have been a loosely organized one. By A.D. 1300 dwellings achieved the greater lengths of northern Iroquoian style, hence the term – “longhouse”. These longhouses were arranged in rows of eight or more to a settlement and surrounded by one or more palisades. The semi-subterranean feature associated with the houses of the Upper Ohio Valley were never attached to the side-walls of longhouses in this region of Pennsylvania. Experimental reconstruction of an Iroquoian arbor roofed longhouse (under construction). Longhouse architecture has not been identified for the Late Woodland/Late Prehistoric periods in this section of Pennsylvania. As with the lower Upper Ohio Valley and Allegheny Mountain sections wigwam-shaped houses were the preferred form of architecture in the Great Valley section during the Mason Island, Montgomery and Luray phases. However, none have been identified as having the attached appendage nor have any been linked to a palisaded settlement. This settlement model appears to mirror the early Clemson Island habitation of central Pennsylvania where the houses were loosely organized in linear formation, near small streams. South of the Blue Mountain water gap, the community pattern of the Shenks Ferry culture evolved from unplanned to planned settlements. During the early Blue Rock phase the pattern was evidently like the Great Valley settlement pattern where houses were circular-shaped and loosely organized. By the later, Lancaster and succeeding Funk phases, Shenks Ferry houses evolved into oval-shaped short longhouses with vaulted roofs. Well organized into a planned arrangement of one or more house rings having many houses, the settlements were fortified by one or more palisades. A large circular-shaped structure, of an unknown function, was built in the center of these later settlements. As we have seen, Pennsylvanian’s Late Woodland/Late Prehistoric period houses varied from region to region. The environment and social organization of a culture were major dictates as to the type of dwelling being created. Experimental archaeologists provide us with some detail and guidance relative to how houses were constructed by people of the distant past. 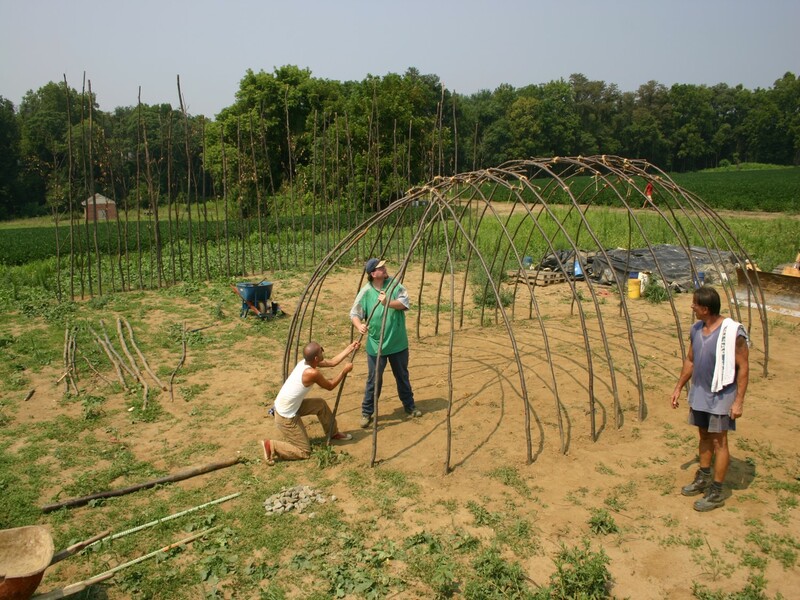 The primary building materials available to them would have been poles for the framework and bark for hafting the pieces together and to cover the building. These resources were harvested from trees growing in the nearby forest. Raw materials would have been manipulated with stone celts, adzes and other tools. Although houses could be built during all seasons of the year, the spring would have been better suited when trees were easily debarked and the softness of the ground made securing the poled framework into the earth an easier task. Because of their size, smaller wigwam structures took less effort while the large longhouses of 100 feet or more in length would have been a corporate task undertaken by most of a settlement’s population. 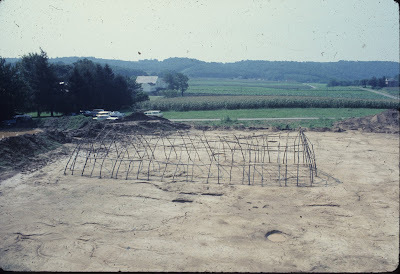 We hope that you have enjoyed reading this bi-weekly addition to This Week in Pennsylvania Archaeology and encourage you to visit us again at this web site for more fascinating information about Pennsylvania archaeology. 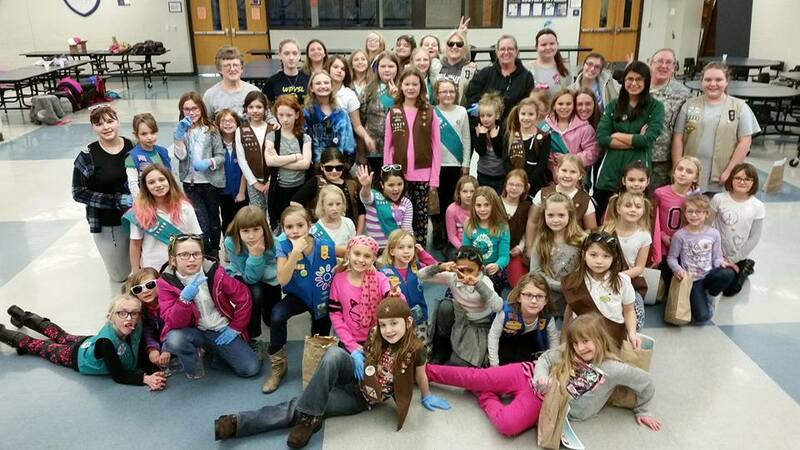 This past weekend the State Museum of PA’s Section of Archaeology participated in a Girl Scout STEM career day, hosted by Community 165 at the Newport High School in Perry County. For our readers who have not kept pace with the ever-growing litany of acronyms out there, STEM stands for Science, Technology, Engineering and Math. For decades, women in the workforce have been under-represented in STEM professions, and this event was designed to expose the scouts to vocational avenues they may not have considered, been aware of, or unfortunately, may have been passively or actively discouraged from pursuing. In the words of the event coordinator, Marla Steele, “This program is to plant the seeds of possibility”. As a sub-discipline of anthropology (the study of humans), archaeology is generally considered a social or “soft” science. Prerequisites of traditional science classes such as physics and organic chemistry are normally absent from college curricula when obtaining a degree in archaeology. Additionally, research questions archaeologists seek to answer are often social in nature. However, it is the system (empirical method) by which they attempt to answer those questions that aligns the field with what is popularly thought of as science. Archaeologists rely heavily upon a variety of science specialists for data collection. Geomorphologists, zoologists, botanists, and not least of which carbon 14 dating laboratories, all contribute towards the goal of creating a broader understanding of past human behavior. Anthropology, in this multi-disciplinary sense, stands at the nexus between the humanities and the sciences, combining the theories of the former with the methods of the latter. 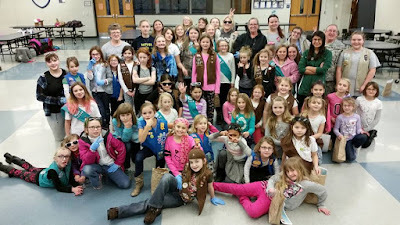 As the fifty girl scouts broke into smaller groups and made their way from station to station learning about civil engineering, micro-biology and environmental science, our display emphasized what archaeology is and is not (sorry, no dinosaurs), why it is important, and how it is conducted. Throughout the afternoon, several of the girl scouts posed thoughtful questions and shared anecdotes about artifact discoveries they’ve made in their own backyards and nearby fields. Thanks again to Ms. Steele for inviting us to participate in this worthwhile program! 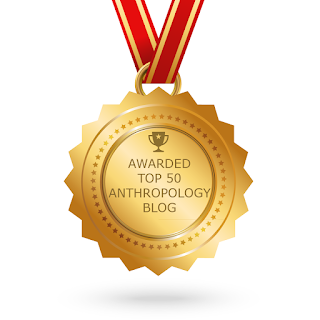 The Section of Archaeology was recently notified that our blog has been chosen as one of the top 50 Anthropology blogs in the world by Feedspot. We are actually number twenty-four on the list along with blogs by ScienceDaily, Huffington Post and the American Anthropological Association. Criteria for selection included the “Quality and consistency of posts” along with popularity on Google, Facebook and other social media. Our blog is an opportunity to connect with the public and provide thought provoking, educational posts. We’ve covered the archaeological heritage of Pennsylvania for all 67 counties, compiled two alphabetical lists of archaeological topics and shared our research discoveries and programs with our blog followers for the past eight years and almost 350 posts. As archaeologists and museum curators our goal is to provide reliable, educational content in a format which appeals to a broad audience. We would like to think that this award is one measure of our success. So if you’ll keep reading, we’ll keep blogging! Thanks to Feedspot for the recognition and most importantly thank you, our faithful followers and readers!